I LOVE cheesecake, it is not something I make very often because I do feel a little (just a little) guilty about eating all those calories. However it is one of my favorite desserts for Easter. This year, this cheesecake was gone in a flash, no leftovers, which is a really good thing (a little less guilt now). I hope you enjoy it as much as my family and friends do. When making cheesecakes, alway bake at least a day or two before serving for added flavor. 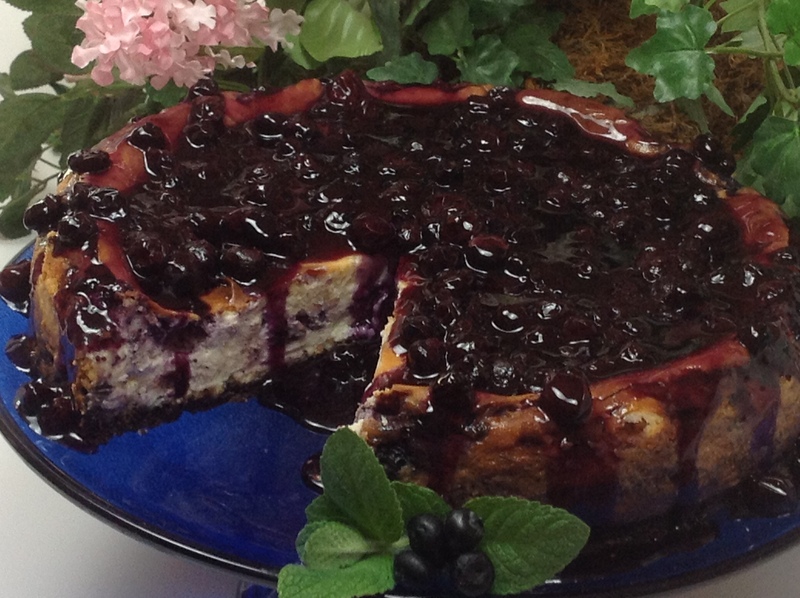 You can change my “blueberry sauce” to any type of fresh fruit you prefer, as well as the frozen fruit inside the cheesecake. For sauce, in a saucepan over medium heat, combine the blueberries, cornstarch, ¼ cup of water, sugar and lemon peel. Stir gently, and bring to a boil. In a medium bowl, mix together cookie crumbs, sugar and melted butter. Press mixture into the bottom of a 9 inch spring-form pan. In a small saucepan, combine blueberries, 3 tablespoons sugar, cornstarch and water. Bring to a boil and continue cooking 5 minutes, or until sauce is slightly thick. Strain sauce through a mesh strainer to remove seeds. In a large bowl, mix together cream cheese and ½ cup sugar until smooth. Beat in eggs, one at a time, scraping down sides of bowl, if needed. Blend in sour cream and vanilla. Pour half of batter over crust. Spoon reserved blueberry mixture over batter. Pour remaining cheesecake batter into pan. Swirl batter with tip of knife to create a marbled effect. Bake 75 minutes, or until filling is set. Cool, cover with plastic wrap and refrigerate at least 8 hours before removing from pan and serving. Serve with blueberry sauce. *To make cookie crumbs, place cookies in a plastic sealable and roll with a rolling pin until ground. If you have a food processor, place cookies in the bowl and process until finely ground. Stuffed breads are such a BIG hit in the east coast! After moving to the mid south, I started baking my own. 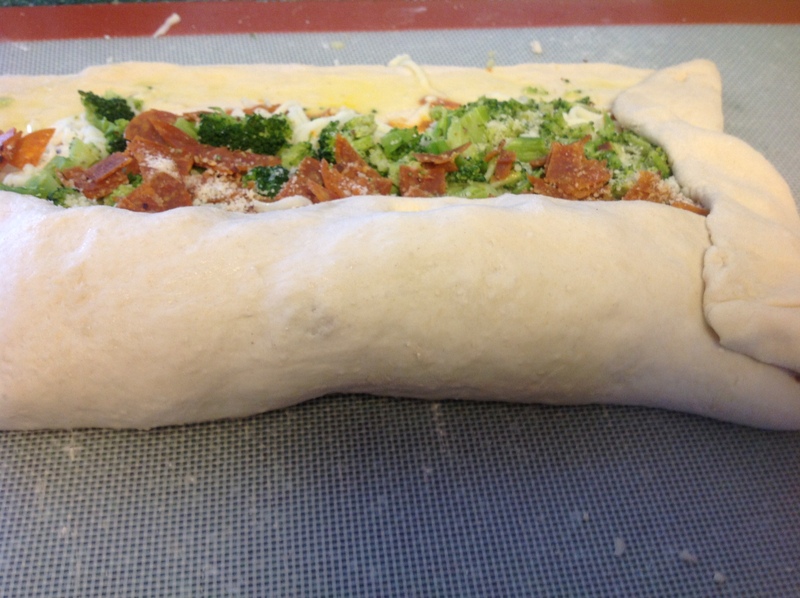 My son Rob’s favorite is broccoli and pepperoni stuffed bread. 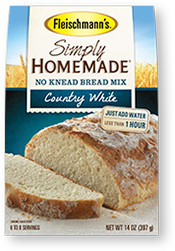 So easy to make, below is the “quick” version made with Simply Homemade® County White Bread Mix (found in the baking aisle of your favorite grocery store). Follow the direction on the back of the box for making this yummy bread, cover bread with plastic wrap and place in a warm spot until doubled (if you have time), about 1 hour. Now comes the really fun part, creating your bread…one of my favorite sayings is “you are only limited by your creativity”….this is especially true when stuffing a bread, because you can stuff it with just about anything. 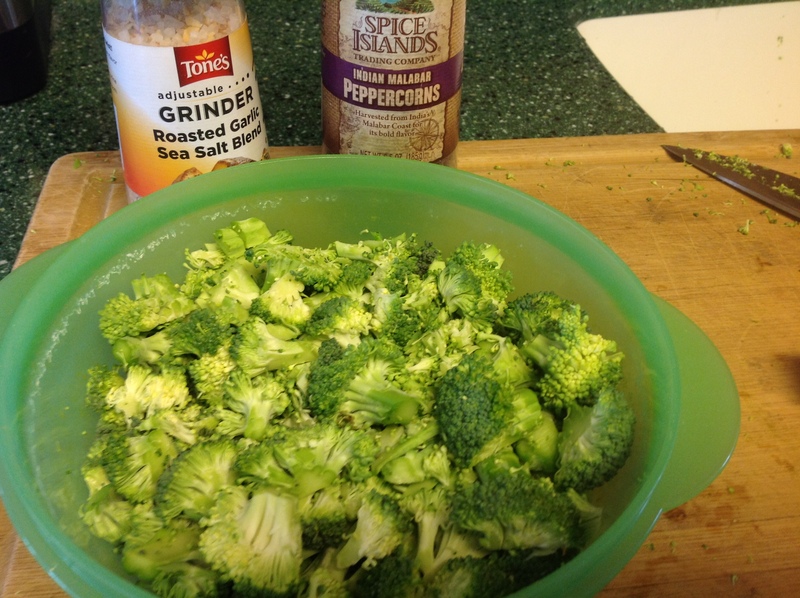 But, today I am making “Rob’s favorite”, so I am stuffing my bread with broccoli, pepperoni, shredded mozzarella, grated parmesan cheese and a little sun-dried tomato pesto sauce, just to “kick it up a notch”….oh yeah, and of course, red pepper flakes. Micro-wave for 5 minutes. Drain and put aside until needed. On a clean work surface or a silicon roll pad, lightly dusted with flour, place bread dough and pat down or roll dough out to a 14″x8″rectangle. 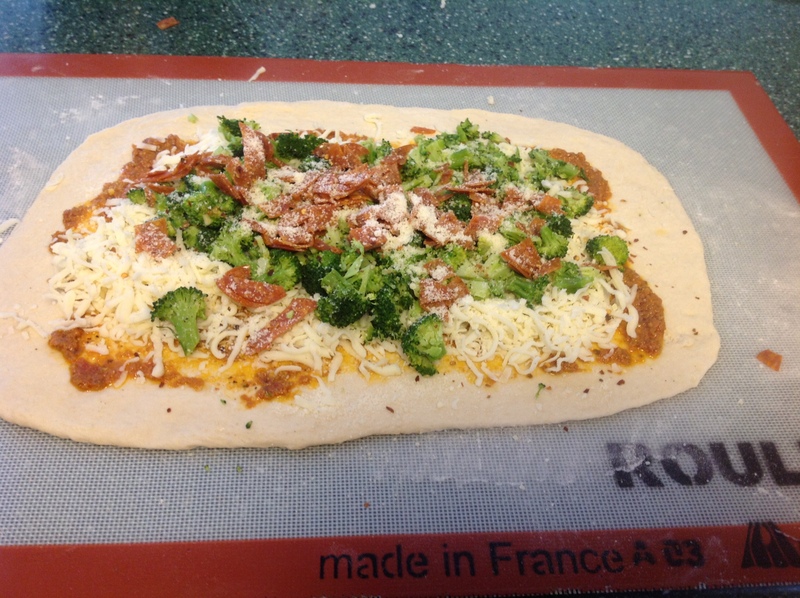 Top dough with pesto sauce (if desired) leaving a 1-inch edge. 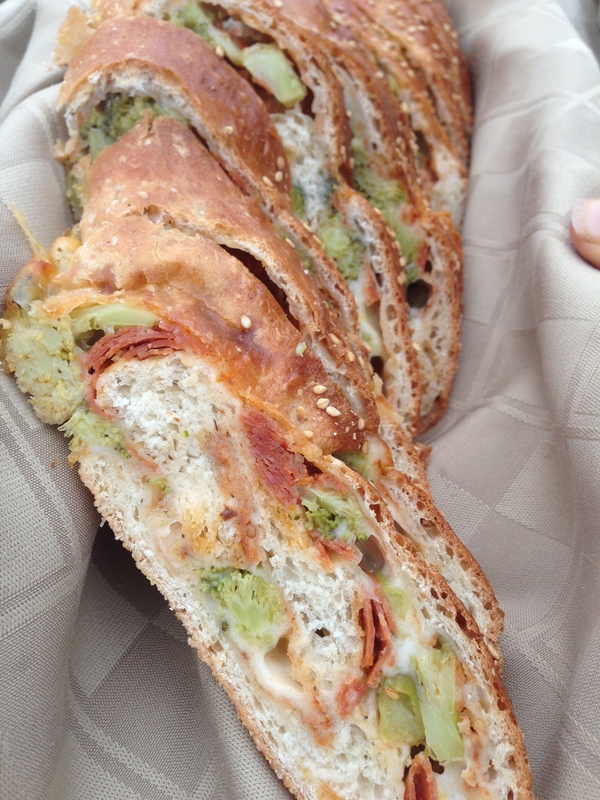 Top pesto sauce with 1 ½ cups shredded mozzarella, cooked broccoli and ¼ cup chopped pepperoni. Sprinkle 2 tablespoons grated parmesan cheese over pepperoni. Brush egg wash along outer edge (this helps prevent ingredients from bursting out). Starting with the side closest to you, roll up jelly-roll style; about ½ way, fold in edges and continue rolling to end. Place bread on a sheet pan or pizza peel dusted with polenta (or corn meal), this will add a wonderful crunch to the bottom of the bread. If time permits, cover and let rise an additional 30 minutes. Preheat oven to 400°F. For optimal flavor use a pizza stone, preheated for 45 minutes. 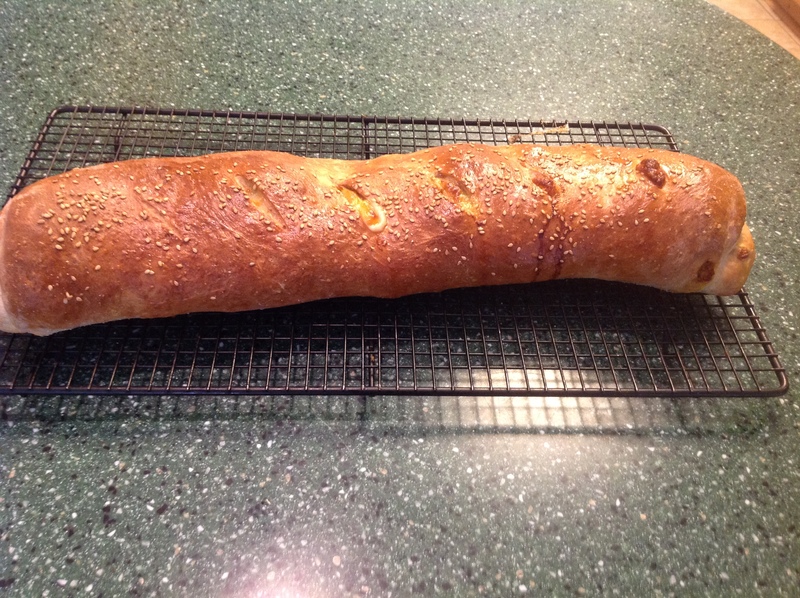 Brush bread with egg wash and top with toasted sesame seeds, if desired. Make several ¼-inch slices diagonally on top. 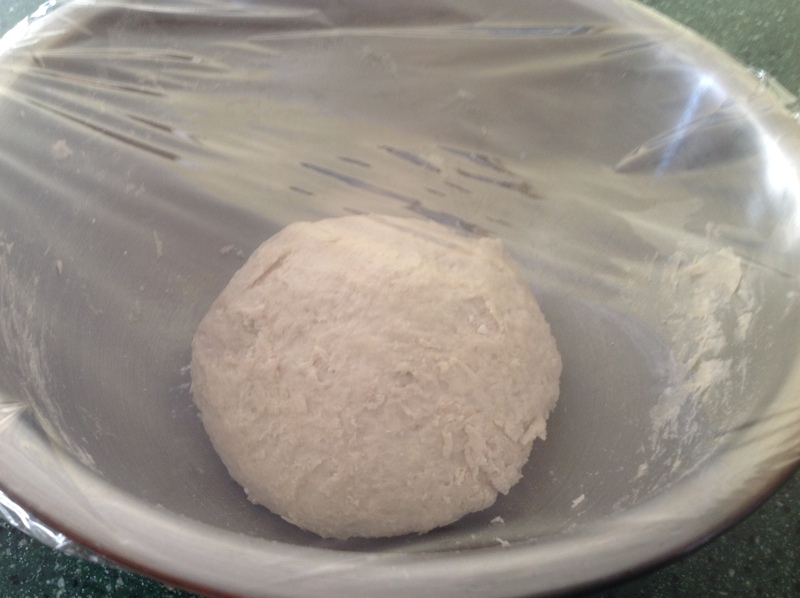 Slide bread onto pizza stone, or place baking sheet in preheated oven. Bake 20-25 minutes until golden brown. Remove from oven and place on a wire rack to cool. This is a GREAT appetizer to bring to any party….Buon Appetito! Prepare bread mix according to package directions. Cover with plastic wrap and place in a warm spot until doubled, about 1 hour. On a clean work surface or a silicon roll pad, lightly floured with flour, place bread and pat down or roll out to a 14 x 8 inch rectangle. Add bread stuffing (see below). Egg wash edges of bread and roll tightly, tucking in the ends before you finish rolling up. Egg wash outside of bread and sprinkle with sesame seeds if desired. Bake in a preheated 400°F oven on a pizza stone for 20-25 minutes. Remove bread and place on a wire rack to cool before slicing. See how easy it is to make this delicious meal, this was made on air in less than 30 minutes….